Reputation and a political future is at stake when Bahia Watson’s Bess (right) is asked to come clean. Yanna McIntosh’s seated Eleanor (center) has a gut feeling there’s more to the story with Nigel Bennet’s Ted (left) listening attentively for the evidence he needs. Some works of art cry out for large canvases. 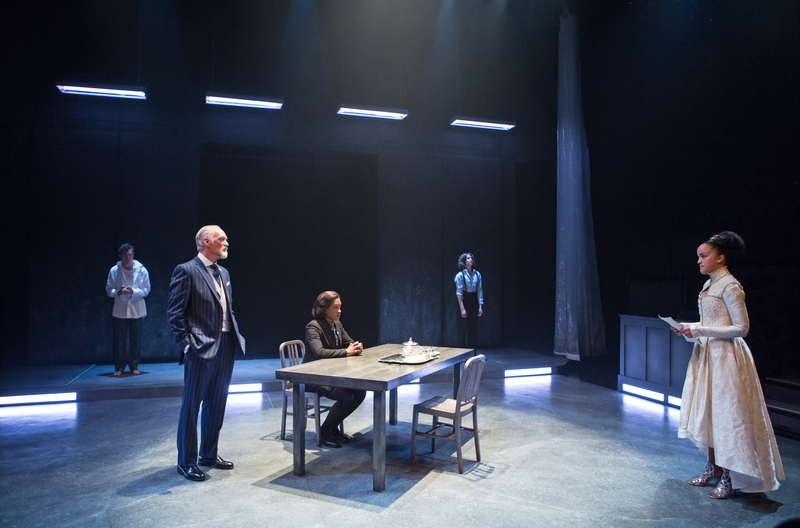 Though it is sparing in its use of scenery or anything approaching spectacle, Kate Hennig’s The Virgin Trial presents a bulletproof case that new spins on historic series of events is not only transferable to the modern stage it’s downright mandatory to compel finicky theatre lovers. So it is particularly gratifying to announce that it has been allowed to stretch to its full height in the thrilling production directed with a master’s hand by Alan Dilworth. The Stratford Festival import added to the Soulpepper Theatre Company line-up opens with a seemingly complacent Princess Bess (Bahia Watson) who is put on the hot seat after a break in at the King’s residence leaving a dead dog on the scene. She’s likely to home shortly with Thom (Brad Hodder), her fatherly figure, already in custody for the intrusion. Or so we think. But these are not ordinary times for this extraordinary family. Reverberating with sexual undertones and biting tension, the truth surfaces with sheer dramatic brilliance. Who can resist a magnetic story of passion, lies and a heinous murder plot to shake us out of our winter slumber? Nigel Bennett’s emotionally disconnected Ted—who appears to mediate matters for a reasonable conclusion of the ‘serious business’ that needs attention—is what manipulative wet dreams are made of. Nothing short of outstanding is Brad Hodder’s lofty contribution of a man on his bended knees for a teenage lover speaks to the treachery of the human heart. Thom deserves much better than this yet his own confession may alter the course of the judicial outcome. And, of course, there’s Bahia Watson whose adolescent voice gives her the natural born right to play all the right cards her character Bess has stacked in the deck for herself. If you fancy the sweet aroma of scandal, The Virgin Trial is one powerful fragrance in the Distillery this month.